Chris wrote a detailed post about Rainbow Sandals and how they are constructed to last a life-time, so I am not going to be talking about that aspect of these sandals, but I just wanted to throw a little something out there about my favorite pair of Rainbows. I bought the hemp sandals by Rainbow years ago in high school. I never wore sandals much at the time, but I just thought the hemp ones looked so cool that I had to purchase them. 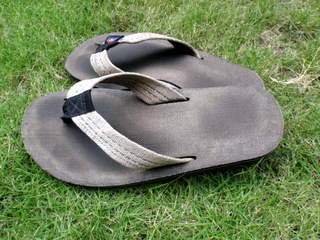 I didn’t wear them a ton till I moved out to Hawaii for the first time about 6 years ago. In Hawaii, as you could imagine, you don’t wear shoes too often, so that was the first time I fell in love with my Rainbows. In my opinion, the hemp straps are more comfortable, conforming more to the contours of the top of your feet. I also think the hemp surface that you stand on is better. Sometimes I feel like the leather gets really sticky and slimy under your feet all day, but I find that the hemp isn’t as bad. Lastly, I’m simply a fan of hemp over leather for style purposes. I think the hemp sandals look the coolest out of all that Rainbow Sandals has to offer. You can get them in brown, black, or natural colored, in single or double layer arch, and with wide straps, thin straps or the fish logo straps. 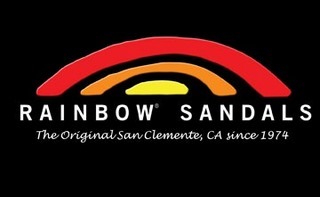 So there are all kinds of options for you to pick out your favorite style of hemp Rainbow Sandals. They cost around $40, but remember they last forever!